‘YouTuber’, an individual broadcaster on YouTube, a largest-in-the-world video-sharing site, provided by YouTube, LLC in the US, have already got popular even in Japan, and, recently, ‘virtual’ creators also start broadcasting. It’s a culture that a 3DCG character called ‘Virtual YouTuber’ (hereafter referred to as VTuber) broadcasts a program. The broadcaster usually turns into a character such as a pretty girl, and broadcast various information in the same way as YouTuber. However, in recent days, Vtubers who perform artistic activities are appearing too. 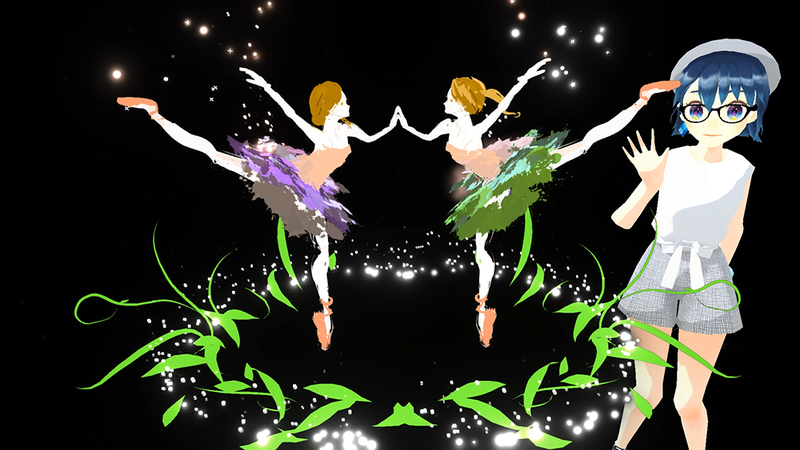 A best example is ‘Emoco’, a virtual artist, who won the Grand Prix at ‘ NEWVIEW AWARDS 2018‘, a global award for VR contents in fashion, culture and art. 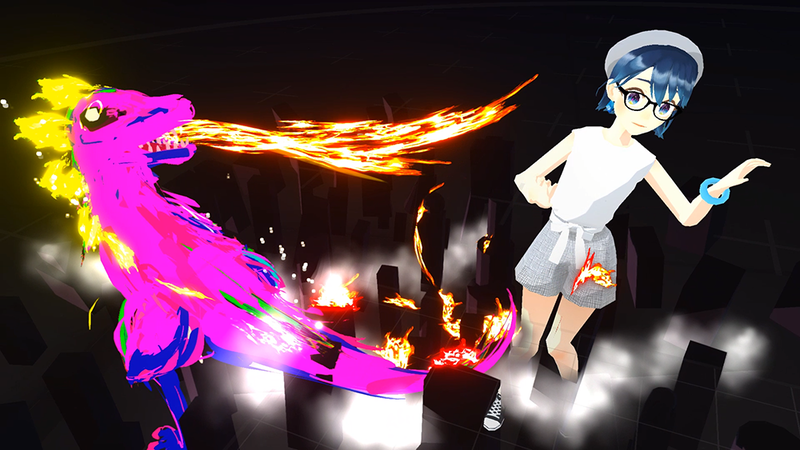 Through challenging daily activity such as virtual events, VR animations, she is establishing a position as a virtual artist. But, why did she start acting as a Vtuber? In this interview, I approach the nature of her art style while asking about the secret story of the VR solo exhibition, ‘Emoco’s First Private Exhibition‘ that won the prize at ‘NEWVIEW AWARDS 2018’. Born in the virtual world / She opened her YouTube channel. She created ‘VMuseum’ in VRChat, which is a virtual art museum anyone can use for free. She took up the post of an art-history teacher in VR Academia. / achieved 1000 subscriberes on her YouTube channel. / She held ‘Emoco’s First Private Exhibition‘ in STYLY. — First of all, congratulations on winning the prize! How did you know about NEWVIEW? Emoco: Thank you! I learnt NEWVIEW from STYLY’s webside. When I started my activity as a virtual YouTuber (VTuber), I set a target, ‘I will hold my solo VR exhibition when I achieve 1000 subscribers on my YouTube channel’. Then, I created my solo exhibition in STYLY. At the same time, I also accessed the site of NEWVIEW from STYLY. It was a start. — Why did you apply for NEWVIEW? 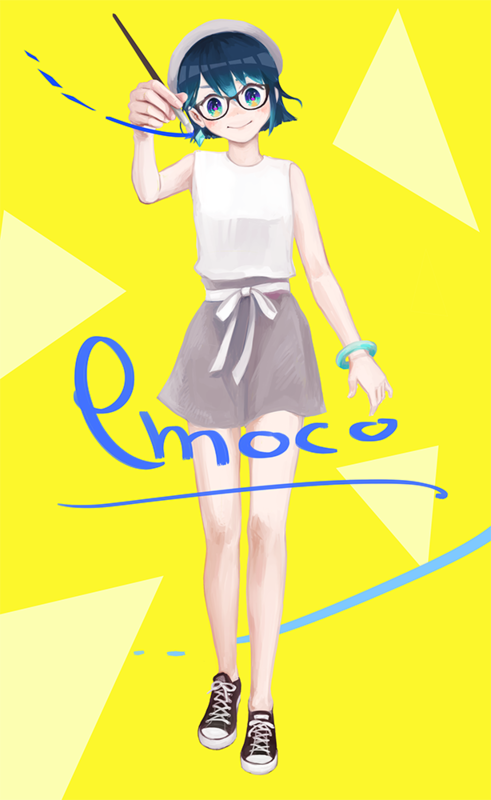 Emoco: It sounded fun as a movie project (lol). Since I didn’t see any other VTubers applying for the competition at that time, I thought I could entertain everyone by showing every detail of my Vtuber activity. I also happened to create a work with STYLY before, so I thought it’s some kind of fate, then I applied for it. — How did you know about STYLY? Emoco: In fact, I knew about STYLY before I was ‘born’ as a VTuber. In 2015, STYLY became famous for being the platform of ‘VR shopping’ where people can purchase clothes in VR space, didn’t it? I was also interested in VR at that time, so I am impressed by the fact that STYLY created such a highly sophisticated content despite the lack of environment and information to create VR content, unlike the situation we have now. It’s fairly common to hold an exhibition in VR space these days. But it was really impressive that STYLY already made it from scratch a few years ago. After that, Yamaguchi CEO in Psychic VR Lab was interested in my live painting and sent a message to me. So it was the second time I heard about STYLY. I found STYLY had evolved into a tool that everyone could create a VR space with, so I thought it helped me to hold the solo VR exhibition I wanted and then I started using STYLY. — Could I ask about why did you decide to become a VTuber? Emoco: Yes. 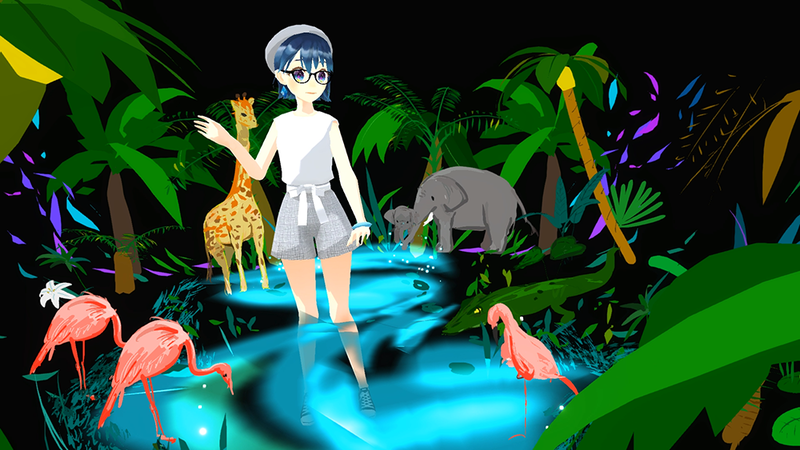 I love to create something, so I became a VTuber as a part of my creative activity. And, VTuber needs various skills such as modelling, video recording, so I thought it could improve my ability to render my art style. — I see. Thank you. Next, I would like to ask about your entry, ‘Emoco’s First Private Exhibition‘. What concept does this VR work have? Emoco: The concept of this VR work is ‘Live’. For my VR solo exhibition, I drew all display items in my live performance and published all events from my application to my competition result in real time via video and SNS. The reason why I chose ‘Live’ as the concept is that we live such a life where we can send and receive information easily with a smartphone, so all contents are supposed to be ‘live’ these days. Especially, this trend is standing out in this year, 2018. For example, the application for live streaming is released almost every month and live events and meet-and-greet sessions are held more and more. I study the history of art and found that there are a lot of arts that reflect the situation when they are created. So, I thought it was interesting to express something in VR by myself as a ‘Vtuber’, which itself is one of the trend words, with ‘Live’ set as the concept. — You expressed ‘now’ by the combination of ‘Live x VTuber‘, didn’t you? What tool do you usually use when you make VR contents? Emoco: I modelled 3D body and buildings with Blender. When drawing pictures, I used Tilt Brush for 3D pictures and Clip Studio for 2D pictures. I made the tool to record the video by myself with Unity according to the performance I want to do. — How did you make ‘Emoco’s First Private Exhibition‘? 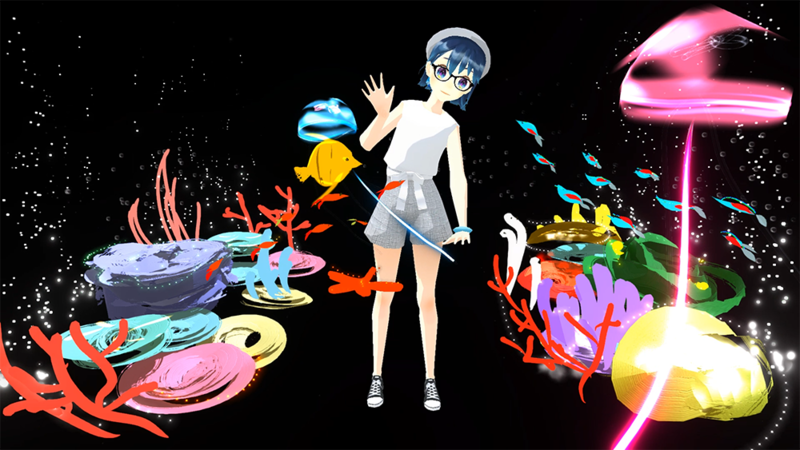 Emoco: I started making this VR work because I wanted to do ‘Virtual Live Paint’ that a virtual YouTuber performs a serious live painting, and ‘Virtual Solo Exhibition’ where I can show my paintings in VR space. As I started making it before I debuted as a Vtuber, it took about half a year, since the end of 2017, to complete this VR work including preparations. I needed to make the tools for VTuber by myself as there was no convenient tool at that time. After my debut, to hit the target of achieving 1000 subscribers on my channel, I was making my paintings and videos step by step, but people barely watched them at the beginning. So I performed 12 live-paint sessions until I achieved the target. It’s hard to perform on live stream as I always felt nervous, but I was able to keep drawing thank to my viewers’ support. I feel I was very lucky because the VR work I was making from my own motivation happened to have the same direction that NEWVIEW had. Thanks to STYLY, the VR solo exhibition itself took just three days or so. I really appreciate being provided with such a wonderful tool. — Where did you care about most when creating this VR work? Emoco: Since I cared about a lot of points, it’s hard to choose one. But I could say it’s the live-painting part. It was very hard to make the video-recording environment as I wanted to do a serious live-painting performance instead of just imposing a character at the corner of the screen as seen in a common live-stream performance. As a technical challenge, I used the mechanism of Mixed Reality, which can superimpose a VR image on a live-action image, to add a VR image to another VR image. However, I couldn’t find such an example anywhere at that time. So, I needed to make a lot of tools with Unity and build a PC tailored for those tools to realize what I want. The point I really cared about is to make face expression and camerawork adjustable to the situation so that my live performance looks sophisticated. ‘Live’ also means ‘having life’. I would be very happy if people who experienced this VR work saw Emoco, a virtual existence, ‘alive’. — Finally, what is your future plan? Emoco: Of course, as a creator, I would like to create wonderful work. In addition, I continue to pursue the expression that takes advantage of the virtual body. Some say people don’t expect VTuber to look ‘virtual’. But, since I am a virtual artist who loves virtual world and art, I want to continue to create what I am interested in in the virtual space at my own pace. They say that art is a mirror that reflects the present day. ‘Emoco’ keeps her eyes on the ‘Live’ factor and combines it with the VR as a new media to lead a new generation of artistic expression at such a time that various live-stream platforms such as YouTube Live, TwitCasting, SHOWROOM, are booming. In near future, the importance of the expression in 3D space would increase more by xR technologies and VR-generation artists would be strongly required for such an era. Entertainment is not essential for life but we cannot enrich our life without it. That’s the reason why I want Emoco to continue to explore a new expression and we keep our eyes on her creative activities. I am looking forward to her next VR work.